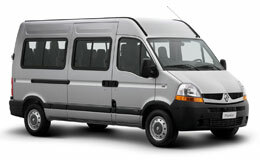 Book a cheap minibus with a trusted taxi firm for journeys in Edinburgh and beyond. Save time, money and hassle. There are a million and one things to think about when you’re planning a trip somewhere, especially if you’re travelling in a large group. Wouldn’t it be nice to think only about your destination, rather than worry about the journey there? From hen parties and stag dos to holidays and school proms, you’d be surprised how often group travel crops up, and how many people worry about getting the group from A to B. At Seven Sevens Cars Limited trading as Capital Cars, we believe that organising transportation should be one of the easiest things to do under these circumstances. Instead of arranging to drive yourself and worrying about where everyone is going to fit, you should consider travelling in style and comfort in one of our minibuses. They sit up to sixteen passengers, and we can provide an additional trailer for luggage if necessary. Whether you require a minibus for a local Edinburgh journey, a city to city transfer or an airport run, we will ensure that you make it to your destination in a relaxed and secure manner. Seven Sevens Cars Limited trading as Capital Cars minibus prices are extremely competitive and our drivers come with a friendly smile and great local knowledge, free of charge! Book a minibus today, then sit back, relax and leave all your stress at home!